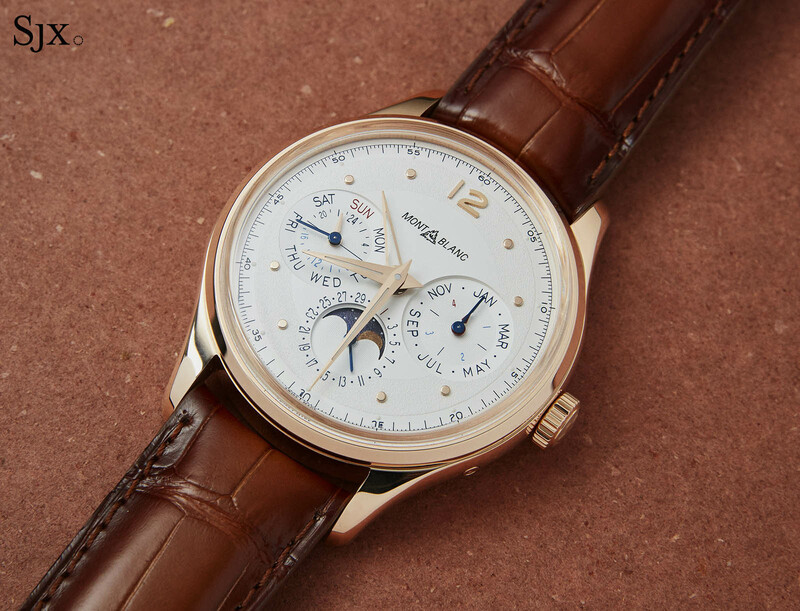 Montblanc is now going all out in offering relatively affordable complicated watches, a strategy exemplified by the 1858 Split Second Chronograph that was one of the highlights of SIHH 2019. But it’s been doing the same for the perpetual calendar for some time now, and the Heritage Manufacture Perpetual Calendar is its best entry into the category to date. 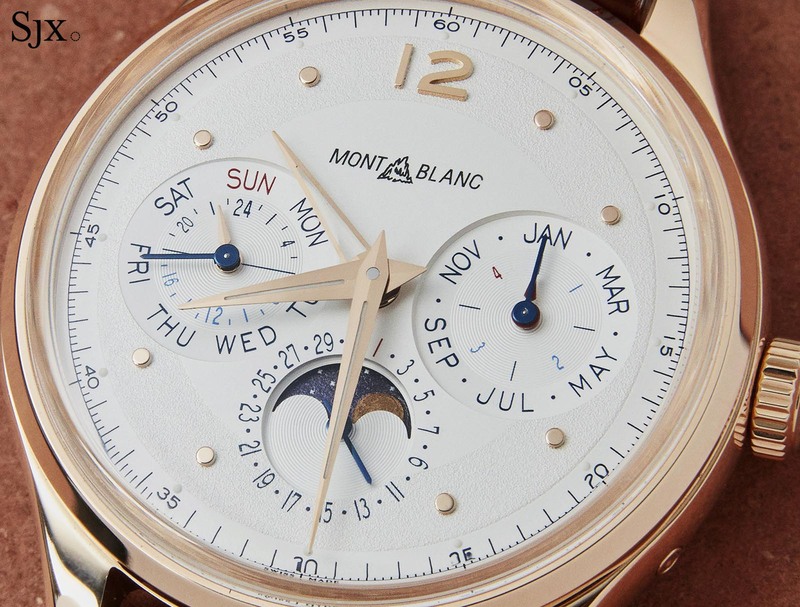 In 2014, Montblanc unveiled what was then the most affordable perpetual calendar on the market, priced at just US$12,800 in steel. 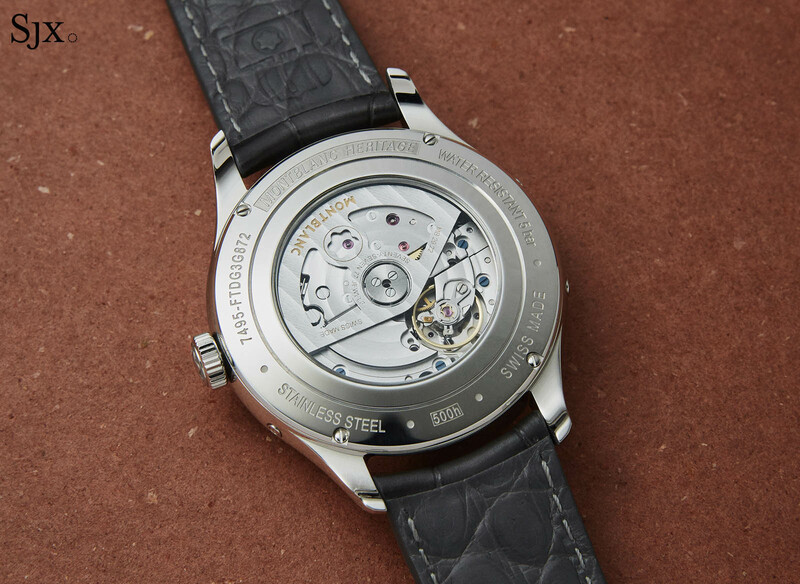 Its affordability was largely thanks to a low-cost Sellita base movement topped with the common Dubois Depraz perpetual calendar module (although Frederique Constant has since claimed the title of cheapest perpetual). But the movement was unremarkable and also small compared to the 40mm watch case, which meant the calendar sub-dials were uncomfortably clustered around the centre of the dial. That’s now changed because the Heritage Manufacture Perpetual Calendar is powered by a newly developed and smartly constructed movement that is unique to Montblanc, although not in-house per se (more on that below). Part of an entirely new, retro-inspired collection, the Heritage perpetual calendar not only boasts a new calibre, but it’s also a masterclass in recasting vintage design elements for modern tastes while keeping it affordable. Montblanc watch chief Davide Cerrato has made no secret of the fact he regards storied chronograph maker Minerva – founded in 1858 in Villeret – as something of a neglected treasure since it was acquired by Montblanc in 2006. Mr Cerrato has made it his mission to leverage on Minerva’s lengthy history as a watchmaker to boost the watchmaking of Montblanc, which only began in the late 1990s. This has meant mining the archives and museum, and drawing on a multitude of elements from vintage Minerva watches, particularly those from the mid-20th century. As a result, the Heritage Manufacture Perpetual Calendar has a classically handsome look of a mid-century wristwatch. In fact, it is slightly reminiscent of the Universal Geneve triple calendar watches of the 1940s and 1950s that had similarly positioned triple sub-dials. The case is modern in size but not overly large, which helps preserve the vintage aesthetic. It’s 40mm in diameter, and available in stainless steel but also in 18k rose gold in a 100-piece limited edition. The case middle is rounded while the bezel is narrow, giving the dial more real estate. The lugs are short and elegantly curved, which ensure a good fit on the wrist. At 12.3mm in height, it is slightly thicker than the entry-level Meisterstück Heritage Perpetual Calendar from 2014 but still relatively slim. But more importantly it is well proportioned, and does not feel thick. But what sets it apart from the competition is the near-perfect dial design that is clean, functional and almost scientific in its sensible layout. In addition to the customary day, date, month, moon phase and leap year indicators, the watch incorporates a second time zone display with a skeletonised GMT hand that can be hidden under the hour hand when not in use. The dial is balanced because the sub-dials are well-proportioned and positioned comfortably between the edge of the dial and its centre. Each sub-dial contains two indicators, which are all easily read except for the 24-hour scale at nine o’clock that serves as the day and night indicator for the second time zone. The number of hashmarks on the scale, along with its size, mean that reading the hours takes a moment. Like the other retro-inspired watches in the 1858 and Heritage lines, the dial sports the vintage-style Montblanc emblem taking from its pens of the 1930s. In keeping with the vintage look, the dial itself is slightly domed – a detail made even more obvious by the sloping edges of the recessed sub-dials. The style is further enhanced by a domed, “box-type” sapphire crystal. The dial is silvered, with two different surface textures, giving it a two-tone appearance. 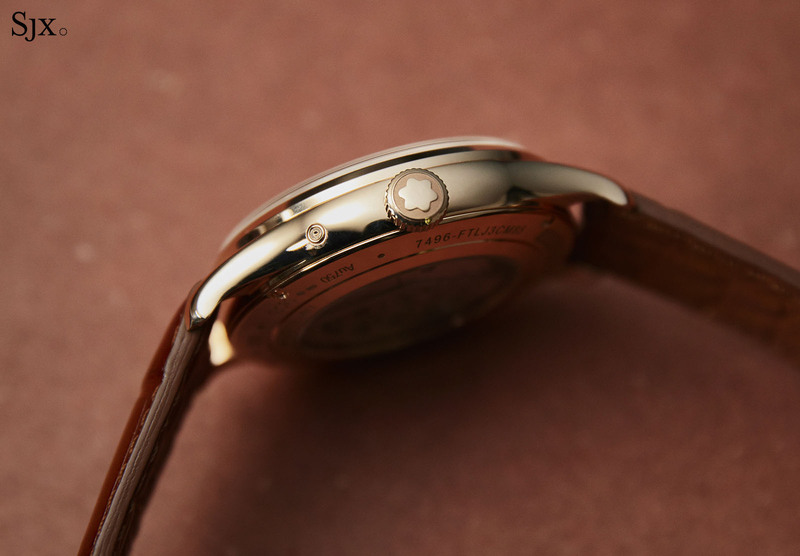 The central portion and minute track are smooth opaline, while the chapter rings for the hours is grained. It features applied dot hour markers along with an applied “12”, accompanied by lanced-shaped hands – all of which are elements drawn from mid-century Minerva wristwatches. To be fair these design elements were not unique to Minerva. In fact, they were generic for the period. But Montblanc and Mr Cerrato have done a better than average job – there are countless vintage-inspired watches out there – at blending the various details into a relatively distinct look repeated throughout the whole of the Heritage line. As far as vintage-inspired watches go, the execution is fresh, purposeful and perhaps one of the most complete realisations of Mr Cerrato’s approach to date. The proportions of the dial are telling of the significant changes inside the watch, which is powered by the self-winding cal. MB 29.22. It has a frequency of 4Hz and a 48-hour power reserve. It’s a brand new, proprietary movement made exclusively for Montblanc by ValFleurier, the large movement manufacturer owned by Swiss luxury goods conglomerate Richemont, Montblanc’s parent company. Notably, the base movement is identical to that found inside the Vacheron Constantin FiftySix base models and the Piaget Polo S automatic. But the movement actually made its debut almost a decade ago as the 1904 MC when the Calibre de Cartier was launched in 2010. Although the base movement is shared, it has been tweaked here to include a customised rotor and blued steel screws, giving it a separate visual identity. The movement has been dressed up enough to be visually attractive, although all of the decoration is obviously done by machine, as is appropriate at this price point. 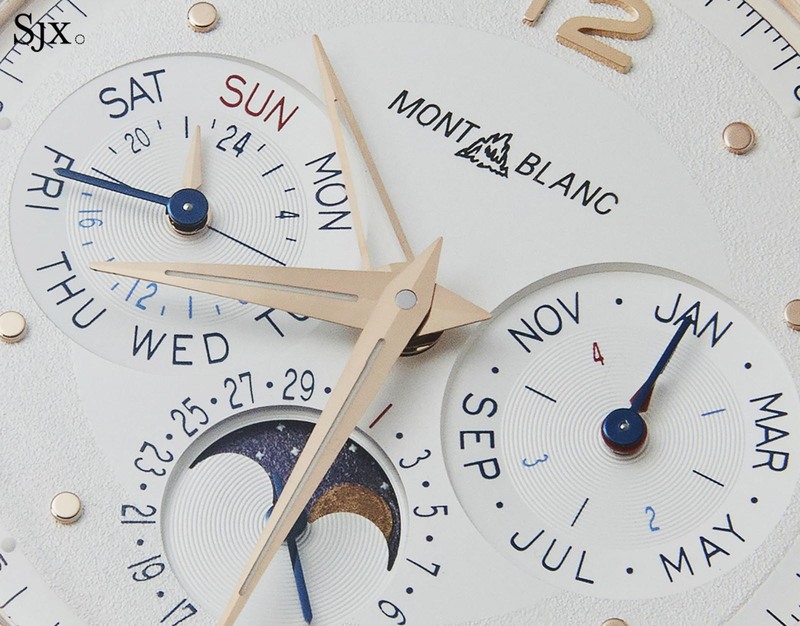 What’s more interesting is the perpetual calendar module, which boasts several interesting and useful features. Instead of relying on conventional springs and levers to drive the calendar indications forward, and only forwards, the mechanism is entirely gear-based. Additionally, the calendar mechanism also incorporates a safety feature that prevents accidental damage to the movement by disengaging the correctors and preventing adjustments between 8pm and 12pm. The gear-based calendar mechanism has the advantage of allowing the pre-synchronised calendar displays to be set forward or backwards without fuss or the risk of upsetting the mechanism by improper adjustment. But it also results in calendar indications that advance over a period of time, instead of jumping crisply at midnight. It’s nonetheless an elegant solution to a complex problem that was pioneered by Ludwig Oechslin in 1996 with the Ulysse Nardin Perpetual Ludwig and more recently used by Cartier in its Astrocalendar. The thread linking the Cartier and today’s Montblanc is the talented Carole Forestier, who was then head of development at Cartier and now has the same role at ValFleurier. In the quickly growing class of affordable perpetual calendars, the Heritage perpetual calendar is one of the strongest contenders. The styling is attractive, even if not imaginative, but more importantly, the movement is well constructed and practical, putting it miles ahead of the competition that typically utilises ETA and Dubois-Depraz mechanics (as Montblanc once did). 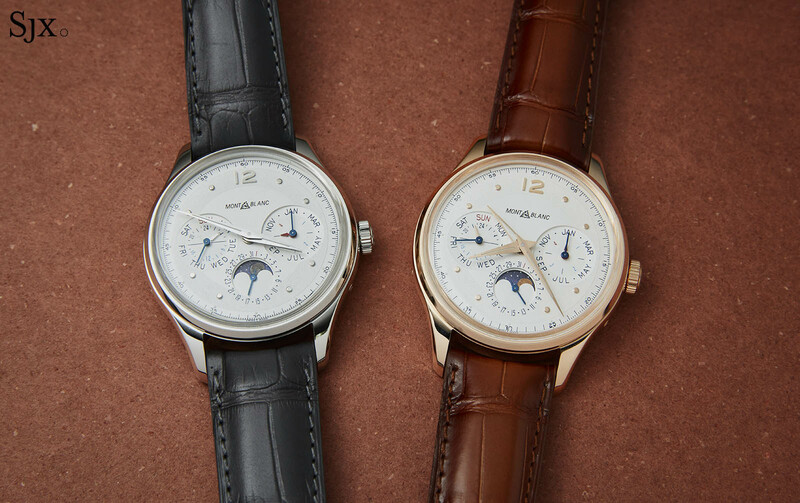 While Montblanc’s chronographs powered by Minerva movements have a higher degree of traditional finishing and craft, they are mostly backward looking. In contrast, the Heritage perpetual calendar boasts a sophisticated modern construction, and so it is equally strong value. 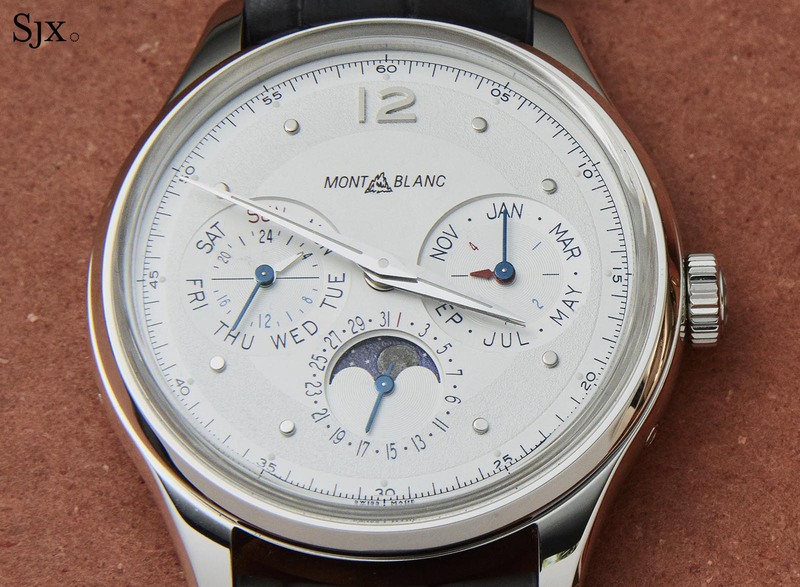 The Montblanc Heritage Manufacture Perpetual Calendar in stainless steel (ref. 119925) is priced at €15,000, while the 100-piece limited edition in red gold (ref. 119926) is priced at €25,000.